Aside from Sandara Park (박산다라), Park Bom (박봄) was the other member who wore Balenciaga in their latest Lonely music video. The star wore a Balmain top with a Balenciaga houndstooth printed skirt from Spring/Summer 2011 as well as a pair of white high heels. 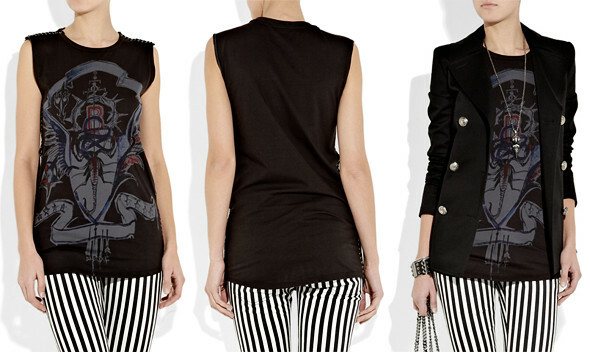 The Eyelet-Embellished Printed Cotton T-Shirt is sold out on Net-A-Porter US for USD$2045.00, sale USD$1022.50. Retailing for £945.00 on Net-A-Porter International/UK. 2NE1 also made a special broadcast apperance on SBS Inkigayo on May 29, 2011. Park Bom (박봄) performed her all-kill single, Don't Cry. The star opted for yet another Balenciaga Spring/Summer 2011 outfit. Her styling was on-point and simple compared to the music video. The Balenciaga houndstooth printed top was styled with a pair of black jeans and Christian Louboutin Bikiki 140 Pumps which matches the top. Perfect, a great look from the members which I haven't seen in a long time.